(Did you go to a sea or an ocean? The waters rise and fall, move back and forth. These are the tides). The tides are 2 types. 2. Neap tides (low tides). ü The tides are nothing but the rise and fall of the level of water in the seas and the oceans. ü The Sun and the moon both exert pull force on the earth. ü The tides are primarily a result of the attraction of the moon. ü The pull force is exerted on the water that is present on the earth and the water can easily rise. ü High tides occur every 12 ½ hours. ü In between two high tides occur two low tides. ü High tides occur when the tide producing forces of both the moon and the sun complement each other. ü These are called spring tides. ü The spring tides occur on full moon and new moon days. ü During this time the sun, the moon and the earth are in the straight line. ü The other types of tides are called neap tides. 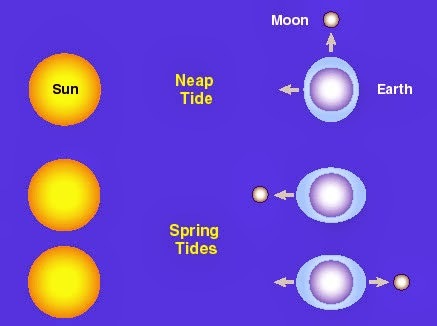 ü Neap tides occur when the pull forces of the sun and the moon neutralize each other. ü Neap tides occur during the 1st and the 3rd quarter of the moon. ü Perigean tides are stronger than the apogean tides. (Why?, Please think for a movement, Perigee means the moon is nearer to the earth and the pull force is more).